The second sleeve is installed. A slightly different sequence of steps was used. I cut part of the sleeve steek and bound off the shoulder stitches before inserting the sleeve. Cut and Sew neckline. The first step is to mark the neckline desired. 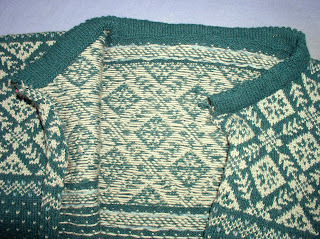 I had planned to steek the front neck, but got carried away when knitting the pattern. A crocheted chain marks the intended neck shaping. To the right is what I had planned if I had steeked, decreasing one stitch every other row. To the left is my final shape, decreasing every row. The neckline needs to be marked before shoulder sewing, so you know where to stop. I machine stitched the neckline shape and cut out the extra fabric, leaving about 1/4" of seam allowance. 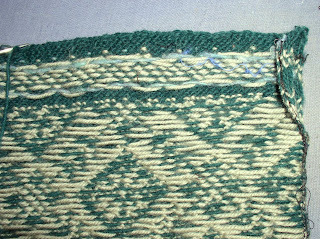 A crochet hook was used to pick up the stitches through the fabric, trying to pick up an equal number on each side of the front neck. I can adjust the number of stitches by increasing or decreasing on the first row. 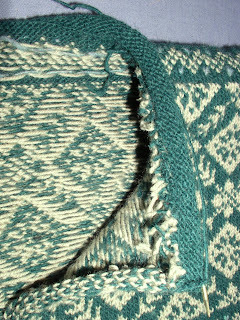 The back neck was bound off for stability, and stitches were picked up from the bound off stitches. The neckband is 1" before the yo, k2tog picot. You can see the raw edges of the neckline. The front edge has also been cut, and has rolled under. All raw edges of the neckline are encased in the two layer band. Next is the button band. It is important to know the stitches/inch gauge and the length needed for the band. This determines the number of stitches needed for the band. I picked up at the rate of one stitch/row and decreased as I purled the next row. It seemed to be a smoother line. The buttonhole band follows. I used a one-row buttonhole. A buttonhole is needed in each layer. Total stitches were counted, length of buttonholes calculated. Stitches needed between buttonholes figured out, not forgetting the button spacing from top and bottom edges. There are 12 rows before the picot edge. Buttonholes are on the 6th and 18th rows. 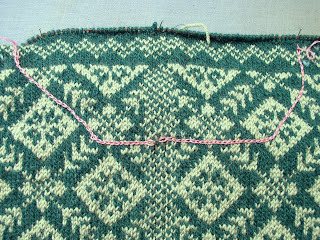 When the knitting is finished, buttonholes are carefully sewn together, joining the two layers. 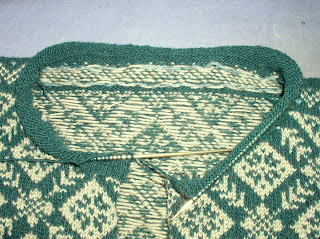 It is important that the sweater steek not be too wide at this point, so as to lie smoothly at the buttonhole. I joined the buttonholes before sewing the facing down on the inside. Now to sew on the buttons. Buttons need space underneath them to allow for the thickness of the band, so they are sewn on loosely and thread wrapped around between the sweater and the button. Next comes the bath. After 6 weeks of work, I'm sure that the project has picked up dirt.